Members of the Congressional Asian Pacific American Caucus at an APA Heritage Month ceremony held May 8 at the U.S. Capitol on May 8 (from left): Sen. Brian Schatz, Rep. Grace Napolitano, Rep. Mike Honda, Rep. Judy Chu, Rep. Madeleine Bordallo, Rep. Grace Meng, Rep. Xavier Becerra, Rep. Bobby Scott, Rep. Ami Bera, Rep. Colleen Hanabusa, Rep. Barbara Lee, Rep. Eni Faleomavaega. WASHINGTON — May is Asian Pacific American Heritage Month (APAHM), a time for all Americans to celebrate the contributions of Asian Americans and Pacific Islanders who have enriched the nation’s history. To commemorate the month, Rep. Judy Chu, chair of the Congressional Asian Pacific American Caucus, introduced H.Res. 189. Sen. Mazie Hirono introduced a companion resolution in the U.S. Senate. Rep. Judy Chu (D-Pasadena), CAPAC chair: “Asian Pacific American Heritage Month is a time for our country to celebrate the ways in which generations of Asian Pacific Americans have contributed to the vibrancy of our nation. From the completion of the Transcontinental Railroad to the entrepreneurs and small business owners that drive our economy today, Asian Pacific Americans have been instrumental in every step of our nation’s growth. Rep. Madeleine Bordallo (D-Guam), CAPAC vice chair: “The Congressional Asian Pacific American Caucus represents a large and diverse community. This year, the 113th Congress welcomed a record five new APA members and the most diverse group of members in the history of the U.S. House of Representatives. I join my colleagues in CAPAC in celebrating Asian Pacific American Heritage Month, and urge all Americans to take time to learn about the many achievements, contributions and sacrifices APAs make to our nation. Rep. Mike Honda (D-San Jose), CAPAC chair emeritus: “As chair emeritus, Immigration Taskforce co-chair and Appropriations Taskforce chair of CAPAC, and as the representative of California’s 17th District, I am proud to celebrate May’s Asian Pacific American Heritage Month. APA Heritage Month is a time for our nation to reflect and remember those Asian American and Pacific Islanders who came before us, and to honor and inspire those still to come, in our fight for civil rights and social justice. “From the makings of the Transcontinental Railroad, to the courage of the 442nd Regimental Combat Team and the Filipino veterans, and the internment of Japanese Americans during World War II; from the pioneering spirit of Dalip Singh Saund, who was the first Asian American to be elected in Congress, to the enduring heroism of our late Sen. Daniel Inouye – the contributions and lessons of AAPIs continue to enrich the fabric and vitality of our nation. Sen. Mazie Hirono (D-Hawaii): “Asian Pacific American Heritage Month is an opportunity to celebrate the culture and stories of AAPI families that enrich our nation. Our unique island culture in Hawaii, from local plate lunches to the pidgin language, is a product of the vibrant melting pot of AAPI cultures. The examples of Hawaii’s distinctive cultural heritage are numerous: Hawaii families enjoy andagi at the Honolulu Okinawan Festival, modern farmers look to traditional Native Hawaiian sustainable agriculture practices for inspiration and Samoan Americans from Hawaii continue to make waves in sports, politics and business. Rep. Nancy Pelosi (D-San Francisco), House Democratic leader: “Asian Pacific American Heritage Month is an opportunity to celebrate the remarkable achievements, rich cultures, and extraordinary contributions of the AAPI community. Americans from Asia and the Pacific Islands have risen above hardship, prejudice, and outright persecution to become an indelible part of the American story. “For generations, Asian Americans and Pacific Islanders have dedicated their lives to developing and defending the heritage of our country. Today, they are defining our country’s future as leaders in business and government, athletics and public service. Their perseverance in the pursuit of opportunity and equality helps shape our identity, ensure our progress, and safeguard the success of future generations. “Nowhere is that truer than in my hometown of San Francisco, where a vibrant and growing AAPI community strengthens our city and reminds us every day that the beauty is in the mix. In working to pass comprehensive immigration reform, we can unite AAPI families and ensure the diversity embodied by these communities remains a virtue of America’s strength. Rep. Joe Crowley (D-N.Y.), House Democratic Caucus vice chair: “I am proud to join my fellow Americans in celebrating Asian Pacific American Heritage Month. Asian Americans and Pacific Islanders have long made, and continue to make, positive and meaningful contributions to New York and our entire country. Whether it is through the sciences, arts, business, or government, Asian Americans and Pacific Islanders have helped shape every facet of American society. Rep. Rubén Hinojosa (D-Texas), Congressional Hispanic Caucus chair: “America is a greater country because of the contributions of Asian Americans and Pacific Islanders, who have shaped the rich collection of customs and traditions that make up our nation. Our Asian Pacific communities have produced influential leaders in business and culture, and have thrived despite the challenges that they have faced. Within the Asian Pacific community, 17 million strong, 1.5 million are business owners who are working to rebuild our economy and 258,183 are veterans who have served our country in the armed services. Rep. Tammy Duckworth (D-Ill.): “Asian Pacific American Heritage Month is a time for us to both reflect on how far Asian Americans have come and how far we still have to go. Asian Americans helped build this country by constructing the railroads that connected this country from East to West. Despite facing injustices such as the internment camps during World War II, many served our country to defend democracy and freedom around the world. Now, we are serving in the Cabinet, Congress, and running Fortune 500 companies in greater numbers than ever. Rep. Eni Faleomavaega (D-American Samoa): “This month we celebrate a rich heritage and pay tribute to Asian Pacific Americans whose sacrifice, hard work, and patriotism have contributed immeasurably to the greatness of our nation. We honor these pioneers, past and present, and those who paid the ultimate price for our freedom. This year, I particularly want to acknowledge a pioneer whose example paved the way for generations of Asian Pacific American leaders. Rep. Al Green (D-Texas): “In honor of Asian Pacific American Heritage Month, I would like to acknowledge the considerable contributions of Asian Pacific Americans to our great nation. The Asian Pacific American community is rich with diversity and history that has enhanced the American experience. Furthermore, I am proud to be a member of the Congressional Asian Pacific American Caucus, which works with members from both sides of the aisle to effectively represent our Asian and Pacific American constituents in Congress. Rep. Alan Lowenthal (D-Long Beach): “This May, I am proud to celebrate Asian Pacific American Heritage Month by recognizing the invaluable contributions that Asian Americans and Pacific Islanders have made to our nation. As we mark 70 years since the repeal of the Chinese Exclusion Act and 25 years since the granting of reparations to Japanese Americans interned during World War II, we remember the strength and determination with which Asian Pacific Americans have fought for justice, freedom, and equality. I am proud to represent a Congressional district of incredible diversity, where more than one in five people are Asian Pacific American. Rep. Jackie Speier (D-San Mateo): “Each May Americans celebrate the rich cultural heritage and contributions of Asian Americans and Pacific Islanders to our nation. The landscape of my own district is brightly painted with the history of the largest population of Filipino Americans in the continental US. We are working together to recognize the Filipino veterans of World War II who fought for the US and were promised full veterans benefits, but who were later denied eligibility for them. May is officially designated as Asian Pacific American Heritage Month by Section 102 of Title 36, United States Code. The observance originally began as Asian Pacific American Heritage Week, which was established through a joint congressional resolution in 1978. The month of May was chosen due to two important milestones: May 7, 1843, when the first Japanese immigrants arrived in the U.S., and May 10, 1869, when the first Transcontinental Railroad was completed with substantial contributions from Chinese immigrant workers. 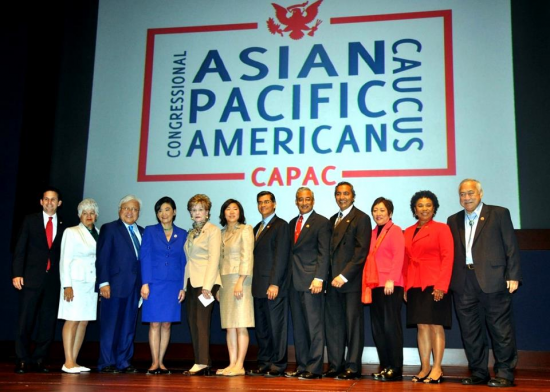 The Congressional Asian Pacific American Caucus is composed of members of Congress of Asian and Pacific Islander descent and members who have a strong dedication to promoting the well-being of the Asian American and Pacific Islander community. It has been addressing the needs of the AAPI community in all areas of American life since it was founded in 1994.